Saudi Arabia’s Crown Prince Mohammed bin Salman has met the world’s two richest men, Amazon founder Jeff Bezos and Microsoft founder Bill Gates, during a stopover in Seattle. The heir to the Saudi throne is coming to the end of a three-week US tour that saw him visit major cities and meet President Donald Trump at the White House. 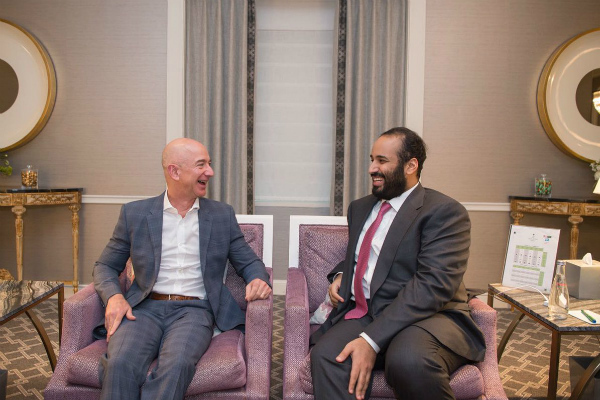 On Saturday, the official Saudi Press Agency pictured the prince sat with Bezos. The founder and president of Amazon, which acquired Gulf e-commerce site Souq.com for an estimated $650m last year, discussed “promising areas of cooperation and investment opportunities related to the kingdom’s Vision 2030 reform agenda with the crown prince, SPA tweeted. In a later photo, Mohammed bin Salman was shown stood next to Microsoft founder Bill Gates, with the two discussing joint development programmes and projects, according to SPA. Forbes ranks the two men as the richest in the world with fortunes of $120.1bn and $90.5bn respectively. Over the weekend Mohammed bin Salman also met with Microsoft CEO Satya Nadila to discuss cooperation and the training of Saudi nationals and Boeing CEO and chairman Dennis Muilenburg to establish a joint venture for maintenance and repairs with Saudi Military Industries Company. The deal aims to see more than 55 per cent of maintenance, repair and rehabilitation of Saudi fixed-wing aircraft and helicopters, as well as weaponisation technology and spare parts, localised. Last week, the crown prince signed off on more than $400bn of deals between the US and Saudi Arabia in sectors ranging from defence to oil.